Alport syndrome is a rare clinical entity characterized by the familial occurrence of hemorrhagic nephritis and sensorineural deafness (Alport 1927). Alport syndrome has a prevalence of 1/5000, with 85% of affected individuals having the X-linked form, where the affected males develop renal failure and usually have high-tone sensorineural deafness by the age of 20. The typical ocular signs are dot-and-fleck retinopathy, which occurs in 85% of the affected adult males, anterior lenticonus, which occurs in about 25%, and rare posterior polymorphous corneal dystrophy. Anterior lenticonus is considered a characteristic sign of Alport syndrome. Posterior lenticonus has been described as a rare manifestation in Alport syndrome ,, and a review of the literature revealed a relative paucity of reports. We present here a case of Alport syndrome with anterior lenticonus and progressive posterior lenticonus. A 24-year-old male presented to our tertiary eye care hospital complaining of cloudy vision bilaterally since childhood, with the right eye affected more than the left. The patient had long-standing episodes of hematuria and was on renal dialysis for chronic renal failure at the time of initial presentation. In addition, the patient had reported difficulty in hearing. Ocular examination revealed best corrected visual acuity of 20/80 +1 in the right eye and 20/60 +1 in the left eye. The patient's manifest refraction was −2.50 −0.25 × 80 in the right eye and −2.50 −2.50 × 95 in the left eye. Intraocular pressure was normal bilaterally. Slit lamp examination of the right eye was within normal limits except for advanced anterior lenticonus, and fleck retinopathy was present on fundus examination [Figure 1]. The left eye, on examination, was within normal limits with the exception of anterior lenticonus, posterior subcapsular cataract, and fleck retinopathy. Direct ophthalmoscopy revealed an oil droplet reflex bilaterally [Figure 2]. The diagnosis of Alport syndrome was made and the patient was advised to seek additional care from a nephrologist and an ear, nose, and throat specialist. Eighteen months later, the patient developed progressive posterior lenticonus bilaterally [Figure 3]. Progression of the cataract in the left eye was also noted. The manifest refraction changed to −4.00 −1.00 × 85 and −8.00 −0.75 ×125 in the right and left eyes, respectively. One year after his initial presentation, the patient underwent renal transplant for his chronic renal failure. The patient was kept on regular follow-up visits as the decision for cataract surgery was delayed as the patient's vision was not significantly affected. The ocular and clinical features of Alport syndrome are identical in both the X-linked and autosomal recessive forms. Retinopathy and cataracts are the only ocular abnormalities described in the rare autosomal dominant form of Alport syndrome. Previous literature has reported variability in the incidence of ocular manifestations of Alport syndrome. Colville et al. reported dot-and-fleck retinopathy in 85% of affected adult males, anterior lenticonus in approximately 25%, and with posterior polymorphous corneal dystrophy being rare. Chugh et al. reported the prevalence of anterior lenticonus in 37.8% of the subjects, retinal flecks in 22.2%, cataract in 20%, and keratoconus in 6.7% of subjects. Teekhasaenee et al. 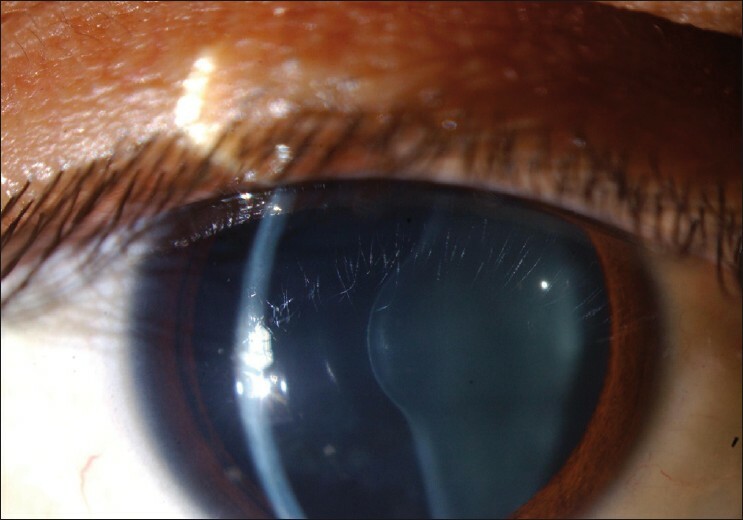 reported ocular manifestations in 82.3% of subjects with Alport syndrome. Posterior polymorphous dystrophy was the most common manifestation, occurring in 64.7% of subjects. Jacobs et al. reported that ocular changes are uncommon and subtle in young patients with Alport syndrome, and that the signs increase in frequency and severity with age. In our case, both anterior lenticonus and cataract were present. The presence of posterior lenticonus late in the natural history of the syndrome may reflect the progressive nature of this manifestation. As Alport syndrome represents a mutation coding for collagen type IV, the lens capsule is considerably thinner. Junk et al. conducted an electron microscopy study of a fragile capsulorhexis specimen and found typical thinned basal lamina with basement membrane disruptions. Similar findings were reported by Citirik et al.,  Kato et al.,  and Takei et al. Choi et al. reported the presence of numerous vascular dehiscences localized at the inner part of the lens capsule, large numbers of capsular dehiscences containing fibrillar materials, and vacuoles in addition to decreased thickness of the anterior lens capsules (4-13 μm). In conclusion, Alport syndrome affects multiple systems, including the eye. The ocular manifestations are important to recognize in order to determine the proper medical and surgical therapy. Posterior lenticonus, which was once considered as an isolated manifestation is being reported more frequently in association with Alport syndrome, suggesting that posterior lenticonus is part of the disease. 3. 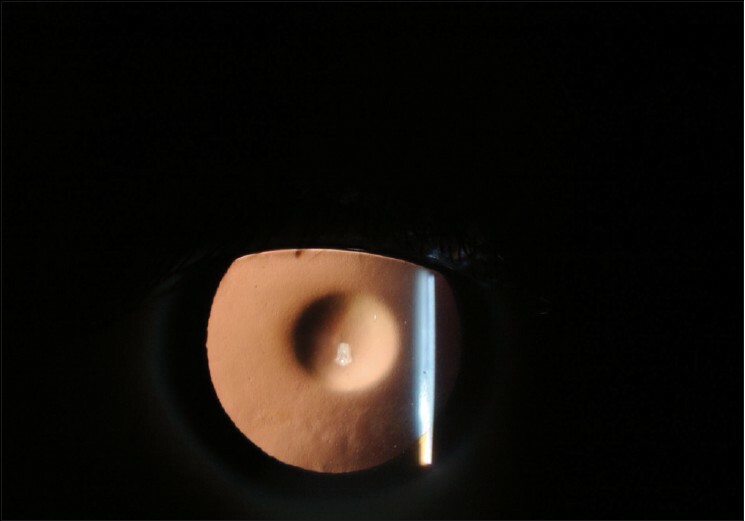 Jaspreet S, Jagit S, Arun K. Phacoemulsification and intraocular lens implantation in an Alport's syndrome patient with bilateral anterior and posterior lenticonus. J Cataract Refract Surg 2003;29:1834-6. 5. Jacobs K, Meire FM. Lenticonus. Bull Soc Belge Ophthalmol 2000;277:65-70. 13. Kato T, Watanabe Y, Nakayasu K, Kanai A, Yajima Y. The ultrastructure of the Lens capsule abnormalities in Alport's syndrome. Jpn J Opthalmol 1998;42:401-5. 16. Zare MA, Rajabi MT, Nili-Ahmadabadi M, Oskouee SJ, Moghimi S. Phacoemulsification and intraocular lens implantation in Alport syndrome with anterior lenticonus. J Cataract Refract Surg 2007;33:1127-30. 17. Seymeno?lu G, Baser EF. Ocular manifestations and surgical results in patients with Alport syndrome. 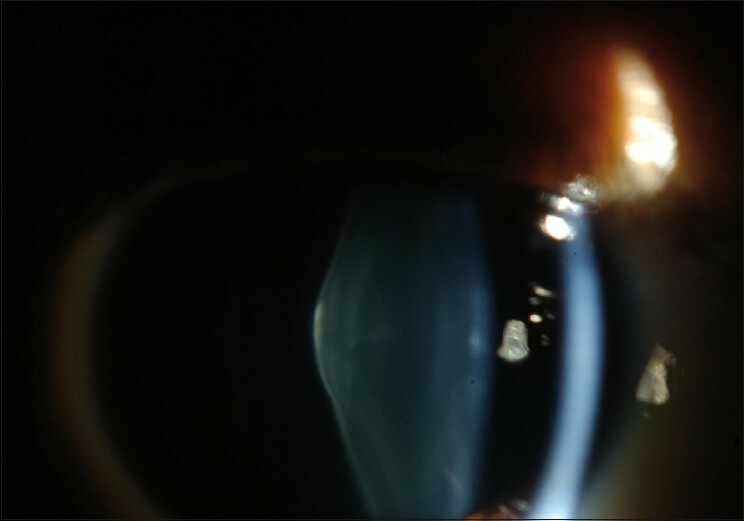 J Cataract Refract Surg 2009;35:1302-6.